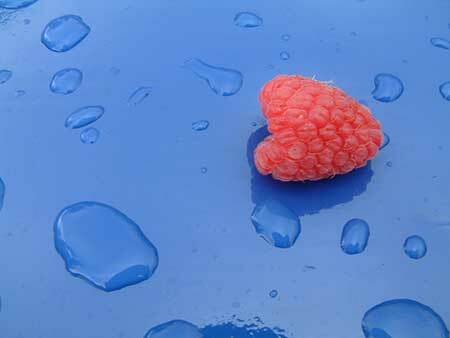 Glen Ample is one of the best summer raspberries—big, juicy, prolific and easy to harvest. And now is the time to plant it. So long as the ground is not hard with frost or waterlogged, you can get these hardy twigs in while they are dormant. Glen Ample, like all rasps, can be bought at this time of the year, as bare root canes. Many suppliers will be able to help, but try and choose Scottish grown where possible. Ask the company where they source their canes to be sure. 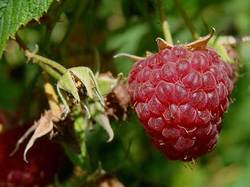 Raspberries are usually planted in rows and trained along a post and wire system. You can also grow them on a single post, or along a boundary fence. Clear all perennial weeds before planting, and plant canes 45 to 60cm apart. Add a 7 to 10 cm layer of thick mulch of bulky compost around the canes to keep weeds at bay. Don't use mushroom compost or rich manure at this stage as both are too strong for the young plants. Space rows 5 to 6 feet apart. Prune the canes down to 25cm after planting. In March, get more compost round the roots and if the soil needs a boost, add a slow release general fertiliser. Poultry manure pellets are good. Glen Ample: Large fruit produced in mid-summer. Heavy yields. No prickles. Picking is easy from the long, straight canes. Grown in Blairgowrie, Perthshire buy from James McIntyre & Sons.